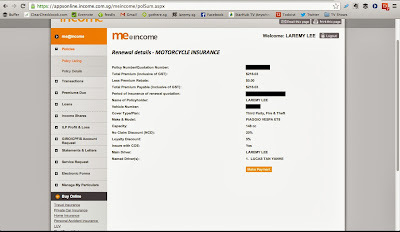 For three consecutive years, I’ve been writing about the prices and procedures related to renewing my motorcycle insurance for the last three years. From a simple one-click process and a cheaper quote than other companies, to a missing “Renew” button and an inflated premium, to the reappearance of the “Renew” button and lowered prices once again, we’ve definitely come a long way. So good job, NTUC Income – thank you for making it easier and cheaper for this customer. 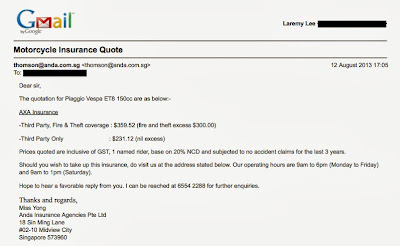 DISCLAIMER: This blog post (“post”) comprises the original review – written on Wed, 11 Sep 2013 – and notes added over the course of my interactions with Mark Yeow trading as Scooter Narcotics. The post was written by me and has been edited for clarity. I am not responsible for comments left by other users. They assume all liability which may result from their comments. This is a review of my experience with Mark Yeow trading as Scooter Narcotics. "The lengths that I will go to/The distance in your eyes"
So when Pooters was last discussed, it was to do with me deciding whether or not to keep it for the next ten years. The decision I finally reached was: I’ll do it; I’ll put up the requisite cash to get Pooters fixed and repaired and roadworthy, even though – pragmatically – it makes more financial sense to get a new scooter. After doing a bit of research, I decided to go with Scooter Narcotics. Having to look for a new mechanic. W, the regular mechanic I used to go to, became reluctant to work on my bike after a while. I wasn’t sure why initially: I’m a loyal customer; I always pay in full and I seldom (if not, never) haggle. But from what I heard, W found my bike “troublesome”. My bike kept on breaking down and the battery kept on losing its charge inexplicably (more on that later). W had every right to reject my bike if he found it cost-inefficient to work on it – i.e. more time spent fixing the bike than what it’s worth. Nevertheless, I’m starting to believe it might not have been my bike; rather, it might’ve been W. I’ll explain this in a bit more detail below. Looking to build a long-term relationship with a new mechanic. I used to go to W for about three or four years. Prior to that, I used T, another mechanic, for three or four years until an unpleasant incident occurred at T’s workshop. That was when I decided to look for a new mechanic and found W.
Like I said earlier, I’m a loyal customer; I stay with a mechanic if I find that s/he knows what s/he’s doing, and s/he can and wants to take care of my bike. So I was also looking for a mechanic to take care of my bike for as long as possible. After a phone call to verify that the mechanic was able to fix Vespas, off to Scooter Narcotics I went on 14 Jun 2013. I made it clear that my intention was to keep the bike roadworthy for the next ten years. Mark Yeow, the mechanic, gave me a range of repair/overhaul options to choose from. 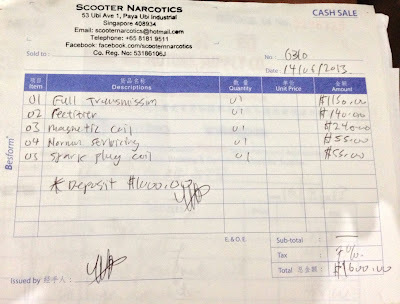 Scooter Narcotics – receipt provided (without item listing of battery). Replace the spark plug coil. On 27 Jun 2013, when I finally collected my bike, I found that Mark Yeow had installed a new battery without consulting me. 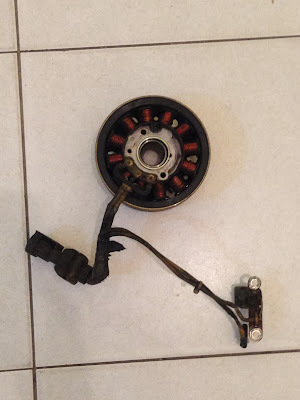 Scooter Narcotics – installed battery without consulting me, provided battery of an unsuitable size and charged me SGD75 for it. I hadn’t requested for the battery to be replaced initially. However, Mark Yeow was of the view that if he didn’t replace my battery, I wouldn’t have been able to ride the scooter. I couldn’t inspect the battery because he’d already placed it in the scooter. Mark Yeow also passed me the battery box from the scooter – he had to remove it in order to install the battery he recommended. 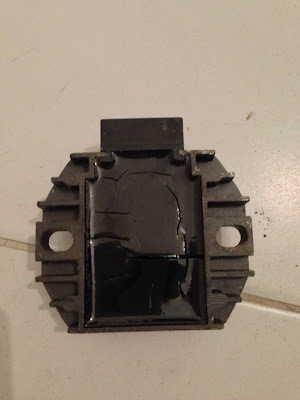 This demonstrates that the battery was of an unsuitable size for my scooter. I did a test ride of the scooter and it was running fine at that point in time. Hence, I indicated to Mark Yeow that I accepted his explanation and paid the remaining SGD600 along with the additional SGD75 for the battery. (A point to note that will be relevant later: Mark Yeow didn’t give me any of the old parts which he had purportedly replaced. I didn’t ask for them either; that was my own naivete. Nevertheless, most mechanics automatically give you the old parts which they’ve replaced as a form of accountability/transparency. Within three weeks – on 17 Jul 2013 – Pooters broke down again i.e. it couldn’t start, the same problem that had been plaguing it since the start of the year. It was a very busy period for me, and the next time I actually could settle this issue was on 3 Aug 2013. And after paying SGD1675 for repairs and having my scooter break down within three weeks, I didn’t feel very good about going back to Mark Yeow and Scooter Narcotics. 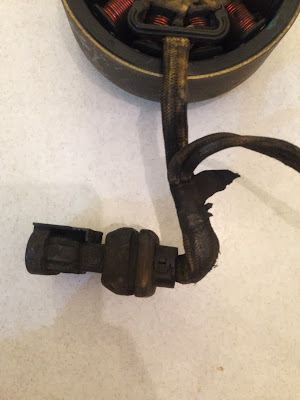 On 3 Aug 2013, I brought Pooters to A, another mechanic, whose advice was to change the rectifier/voltage regulator, the magnetic coil and the battery. 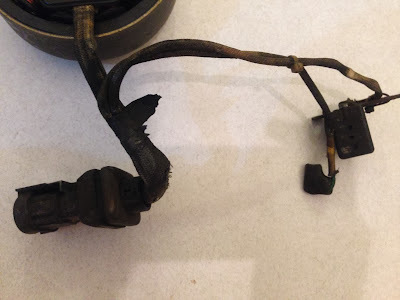 I had some time then so I did a bit more research and I found that the rectifier/voltage regulator issue was a common problem for my scooter model, hence I’m wondering if W, the previous mechanic I used to go to, was unskilled because he couldn’t diagnose the problem. 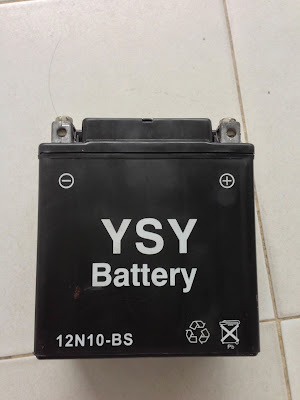 I also asked around at a couple of bike shops and found that the battery which Mark Yeow provided me was retailing at between SGD28 and SGD40. I told A, the mechanic, to go ahead with the repairs and got my bike back on 10 Aug 2013. 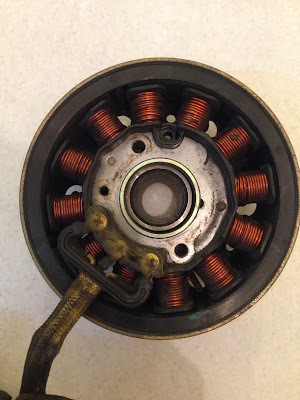 The magnetic coil – note its condition. 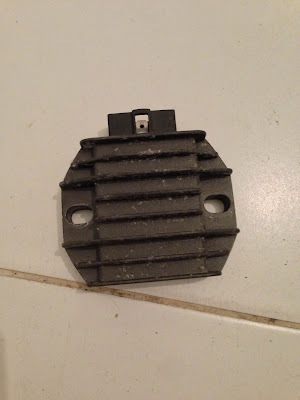 The other side of the magnetic coil (the original part as you can see from the date). Condition of the parts: old and grungy/dusty. 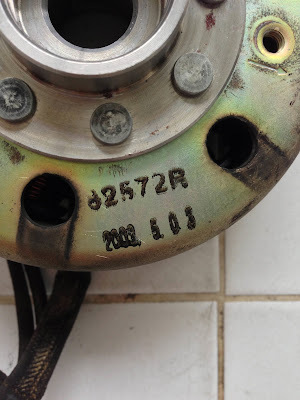 The magnetic coil even has a date stamped on it which looks like “2002 5 03”. 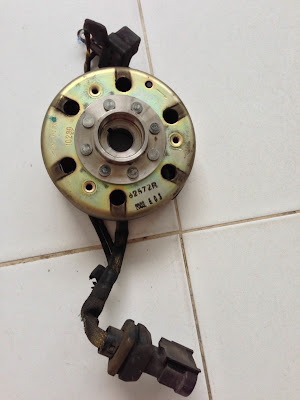 Yesterday, on 10 Sep 2013, I returned to Scooter Narcotics with the parts to ask for my money back. I arranged an appointment with Mark Yeow at 8.30pm, but he arrived at 10.00pm. He told me to “go to the authorities”. So I’ve already lodged a report with CASE – I hope they’ll take it up. After CASE replied to me with some clarification, I weighed my options and decided to lodge a claim at the Small Claims Tribunal. Together with Mark Yeow trading as Scooter Narcotics, I attended a consultation at the Small Claims Tribunal. My view: I wanted to reach an amicable settlement. Mark Yeow trading as Scooter Narcotic’s view: he was not going to refund me my money. The assistant registrar fixed a date for a further consultation on Thu, 17 Oct 2013. Together with Mark Yeow trading as Scooter Narcotics, I attended a further consultation at the Small Claims Tribunal. The assistant registrar fixed the hearing date for Fri, 25 Oct 2013. I went to the Small Claims Tribunal for a hearing on Fri, 25 Oct 2013. The referee ordered Mark Yeow trading as Scooter Narcotics to pay me SGD619 in costs, based on the fact that I had to go to another mechanic to change/replace/install parts which were supposed to have been changed/replaced/installed by Mark Yeow trading as Scooter Narcotics. I will provide more updates when I receive the payment from Mark Yeow trading as Scooter Narcotics. As Mark Yeow trading as Scooter Narcotics has not paid me the SGD619 in costs, I have proceeded to file a Writ of Seizure and Sale. This will allow the bailiff to enter Mark Yeow trading as Scooter Narcotics’ premises to seize his items for auction. The costs owed to me by Mark Yeow trading as Scooter Narcotics will be recovered from the proceeds of the auction. The total amount, inclusive of disbursements, is now SGD759. As of today, Mark Yeow trading as Scooter Narcotics has not made any attempt to service the debt. Hence, the bailiff has proceeded with executing the Writ of Seizure and Sale at Mark Yeow’s Scooter Narcotics workshop. Hence, I have filed a request for the bailiff to proceed with carrying out the auction sale of the items that were seized from Mark Yeow’s Scooter Narcotics workshop. This is so I can get back the monies owed to me by Mark Yeow trading as Scooter Narcotics. I called up the Small Claims Tribunal to ask for an update on the auction of the items seized from Mark Yeow trading as Scooter Narcotics. The bailiff went down to serve the notice of auction to Mark Yeow trading as Scooter Narcotics but found the seized items missing, and an investigation is being carried out. I was informed that Mark Yeow trading as Scooter Narcotics moved from his previous workshop at Ubi to a workshop at Kaki Bukit. I filed a new request for the bailiff to proceed with carrying out – at the new location – the auction sale of the items that were seized from Mark Yeow’s previous Scooter Narcotics workshop. The bailiff went down to serve the notice of auction sale to Mark Yeow trading as Scooter Narcotics. Mark Yeow trading as Scooter Narcotics informed the bailiff that he was willing to make a settlement. A meeting for Thu, 3 Apr 2014 at 9.30am was arranged at the State Courts, in which Mark Yeow trading as Scooter Narcotics will make a settlement. I arrived at the State Courts today at 9.20am. I waited until 11am but Mark Yeow trading as Scooter Narcotics did not show up. During this interval, I asked the bailiff to try contacting Mark Yeow trading as Scooter Narcotics. The latter could not be contacted; his phone was switched off. At 11am, just as I was about to leave, Mark Yeow trading as Scooter Narcotics called the bailiff and informed him that he could not attend the meeting today because his father had taken ill.
Mark Yeow trading as Scooter Narcotics agreed to do a transfer of the monies owed to me – SGD984 at this point in time – into my bank account by 6pm today. I emailed, Whatsapped and texted Mark Yeow trading as Scooter Narcotics my bank account details and the amount owed to me. At 6pm today, I checked my bank account balance but Mark Yeow trading as Scooter Narcotics had not made the transfer. The bailiff will proceed with the auction sale as planned so I can get back the monies owed to me by Mark Yeow trading as Scooter Narcotics. Mark Yeow trading as Scooter Narcotics has transferred SGD984 to me as settlement for the case. I will proceed to file the release papers. I filed a Request for Release, in which the property taken from Mark Yeow trading as Scooter Narcotics and seized on 4 Dec 2013 will be released by the Bailiff. The request has been accepted for processing by the State Courts. There’s nothing quite like opening the throttle on an open road and feeling the wind whipping through your non-existent hair.